As you can see in this aerial view there are only a couple of ways you can get to Fort Kent. By the way, the big area in the middle/left of the image is the North Maine Woods. You’ll notice there aren’t any paved roads. We kind of like it that way, lots of gravel logging roads for hiking, snowmobiling, ATV use and of course hunting and fishing. 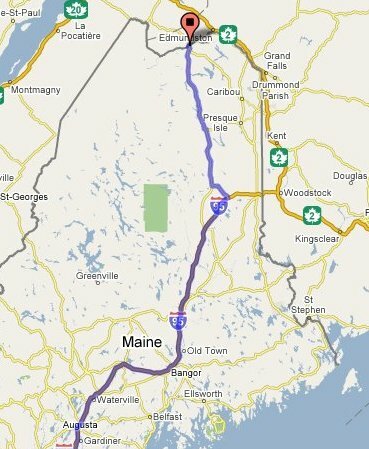 Basically there are two ways to get here, around the side of Maine, and straight up the middle. Both are quite scenic and chances are if you are coming up in the spring and early summer you’ll need to keep your eyes open for wildlife. Moose and deer are common roadside attractions. Take Interstate 95 North, keep going… and going and going. Get off at exit 302 in Houlton, ME, almost to the end of 95. Turn left onto US1. Keep going… and going and going. When you see a sign that says Key West 2390 miles the other way, right by the bridge to Canada look to your left, you are there. Note: You can shorten your trip by taking 161 North out of Caribou to Fort Kent. Again take I 95 north, this time get off at exit 286 in Smyrna Mills, Turn left on Oakfield Rd, and look for Route #212. About 10.1 miles West you will find Rt.11. Stay on Rt 11 north for about 79 miles until you get to Fort Kent. Turn left. on Rt #1. About .6 miles, right across from the International Bridge to Canada is the Northern Door Inn. Note: You can shorten your trip by getting off at exit 264 at Sherman and getting onto Rt 11 there. Stay on Rt 11 North all the way into Fort Kent. 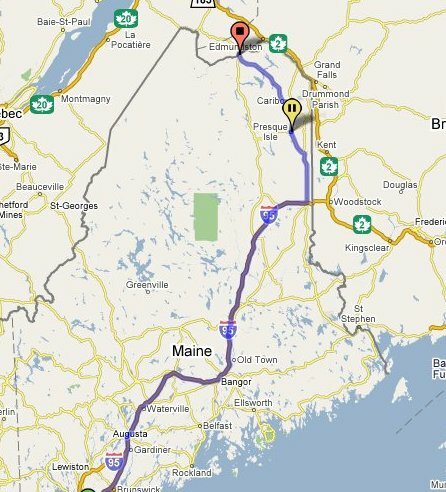 Take the Trans Canada Hwy to Edmunston, NB. Take Exit 18 toward Hwy 120, turn left at Blvd Herbert, continue to Rue L’Eglise. Turn left on Rue Laporte, then right on Hwy 120. Take Hwy 120 for about 26 km. Bear slightly left onto Hwy 205, continue about 4.5 km into Clair, NB. Turn left at the bridge to the US. Directly across the street from US Customs is Northern Door Inn. 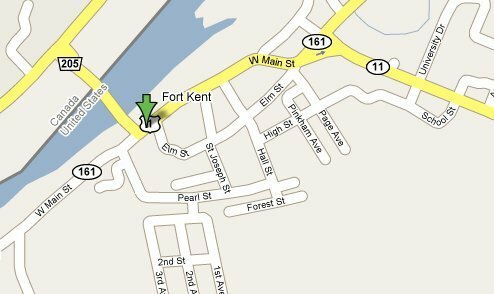 It’s really hard to get lost in Fort Kent, but here’s the map just in case. Just look for the bridge over the St John River to Canada. Directly across the street is the prettiest little Inn in the state of Maine, that’s us.